Kitchen Window: Valentine Hearts That Are Meant To Be Broken These edible treasures would be too pretty to eat — if they weren't so delicious. 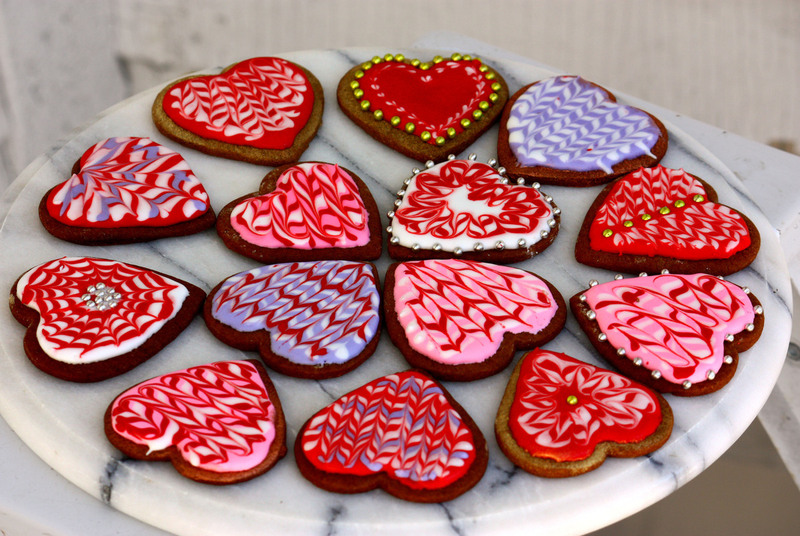 Bake a batch of gingerbread or shortbread hearts, bedeck them with royal icing — and if it suits your mood, break them in half before devouring them. 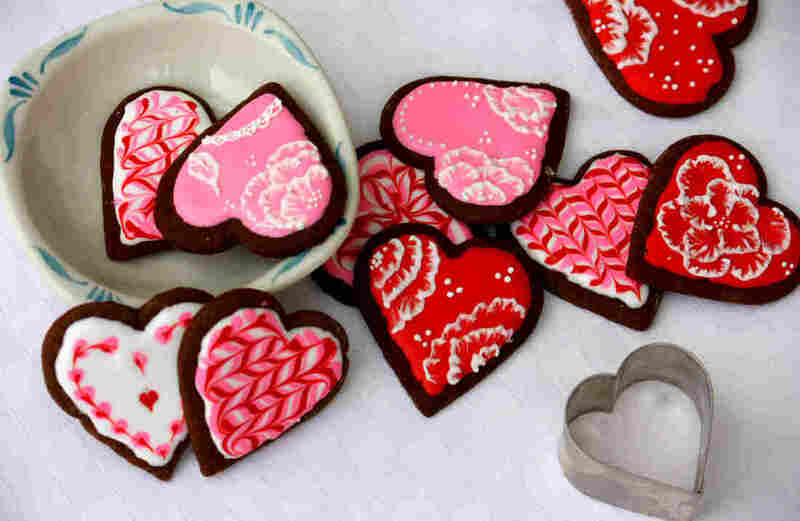 Get recipes for Thin Crisp Gingerbread Cookies, Shortbread Hearts and Royal Icing. In first grade, my heart was stolen by Mark, who sat next to me and had an advanced phonics book (which I also craved). Then there were Peter, Eddie, Raja and Michael. These serial crushes continued right on up through my early 20s, at a rate of approximately three a year. Boys. I fell for their incipient mustaches, their bad attitudes and foul mouths, their poor poetry and bass guitars, their careless humor. I saw their swagger for what it was, but I loved it anyway. When you're a kid, conversation hearts, waxy chocolates and powdery-smelling carnations are the currency of Valentine's Day. (That and a broken heart or two.) But a few years ago, my young daughter and I started a new tradition — one a whole lot tastier, and not dependent on the fickle affection of boys. 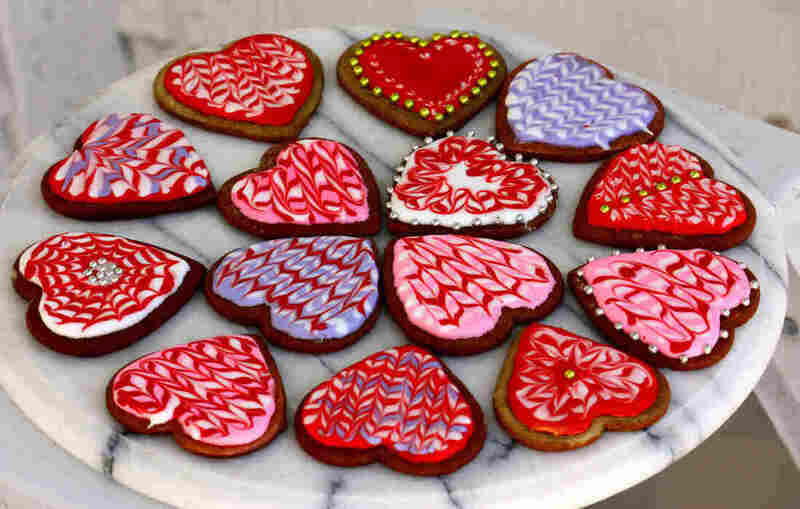 We started baking gingerbread Valentine hearts — magnificent, ephemeral delights we learned to decorate from a book (Julia Usher's Cookie Swap). Now Valentine's brings happy afternoons in the kitchen while the late-winter sun slants in, illuminating the dots and paisleys of our edible treasures. We marble the wet icing with toothpicks or darning needles and stud them with dragées and luster dust. We brush-embroider lines of icing into flower petals with a sheared-off old paintbox brush. We labor over every cookie, just as if it weren't going to vanish in two bites. As we work, I surreptitiously watch my 7-year-old, so like me in so many ways, for symptoms of the romantic affliction, for signs that a Hunter or Oscar or Elijah has made away with her heart. I never say a word, but I look for sighs, for the chin tilted on the palm, the little face staring out the window — telltale evidence of mooning. But Zoe's brow is furrowed in concentration as she wields the toothpick, the craft brush, the parchment cone. Beneath her hands psychedelic patterns bloom, and when she sighs, it's a sigh of satisfaction. "Look how beautiful, Mama!" Then, more pragmatically, "When can we eat them?" My daughter's face is the face of a future heartbreaker — I see it all written there, in the cheekbones, and there, in the limpid eyes. But for now, she's just a kid. I can no more protect her from the storms and sunlight of romance than I can protect these Valentine hearts from being devoured on the spot and left in a million crumbs. Nor do I want to, for hearts are made to be filled and broken, mended and made new again. After we finish, I regard the hearts, in all their jeweled splendor, for one long moment. Really, they're too beautiful to eat. But then I do anyway, snapping each brittle heart in half, letting the ginger sting my tongue. A flash of spice and a moment's pleasure, and it's gone. Only the memories, more sweet than bitter, remain. These cookies, from Cook's Illustrated's The New Best Recipe (America's Test Kitchen, 2004) yield a waferlike, not-too-sweet ginger snap that makes a perfect canvas for your icing masterpieces. And they can be made with either a food processor or an electric mixer. In a food processor, process the flour, brown sugar, baking soda, cinnamon, ginger, cloves and salt until combined, about 10 seconds. Scatter the butter pieces over the flour mixture and process until the mixture is sandy and resembles very fine meal about 15 seconds. With the machine running, gradually add the molasses and milk; process until the dough is evenly moistened and forms a soft mass, about 10 seconds. Alternatively, with an electric mixer, stir together the flour, brown sugar, baking soda, cinnamon, ginger, cloves and salt at low speed until combined, about 30 seconds. Stop the mixer and add the butter pieces; mix at medium-low speed until the mixture is sandy and resembles fine meal, about 1 1/2 minutes. Reduce the speed to low and, with the mixer running, gradually add the molasses and milk; mix until the dough is evenly moistened, about 20 seconds. Increase the speed to medium and mix until thoroughly combined, about 10 seconds. Adjust the oven racks to the upper and lower-middle positions and heat the oven to 350 degrees. Line 2 baking sheets with parchment paper or spray them with nonstick cooking spray. Remove 1 dough sheet from the freezer; place on the work surface. Peel off the top parchment sheet and gently lay it back in place. Flip the dough over; peel off and discard the second parchment sheet. Cut the dough into 2- to 3-inch gingerbread cookies, transferring the shapes to the prepared baking sheets with a wide metal spatula and spacing them 3/4 inch apart; set the scraps aside. Repeat with the remaining dough until the baking sheets are full. Bake the cookies until set in the centers and the dough barely retains an imprint when touched very gently with a fingertip, 10 to 15 minutes, rotating the baking sheets front to back and switching positions top to bottom halfway through the baking time. Do not overbake. Cool the cookies on the sheets 2 minutes, then remove the cookies with a wide metal spatula to a wire rack; cool to room temperature. Gather the scraps; repeat the rolling, cutting and baking steps. Once the cookies have cooled (which will happen quickly, as they're so thin), ice them. These are liberally adapted from a recipe in Sheila Lukins and Julee Rosso's venerable The Silver Palate (Workman, 1982). They freeze well but are quite brittle, so work gently when you're icing. In a stand mixer fitted with the paddle attachment, cream butter and confectioner's sugar together until light. Sift flour and salt together and add to the creamed mixture. Add vanilla and blend thoroughly. Scrape the dough onto a floured work surface, divide in half, and flatten into disks about 1/2-inch thick. Wrap in plastic and set in the freezer until slightly firm (but not rock hard), about 5 to10 minutes. Roll the dough out to slightly less than 1/4-inch thick. 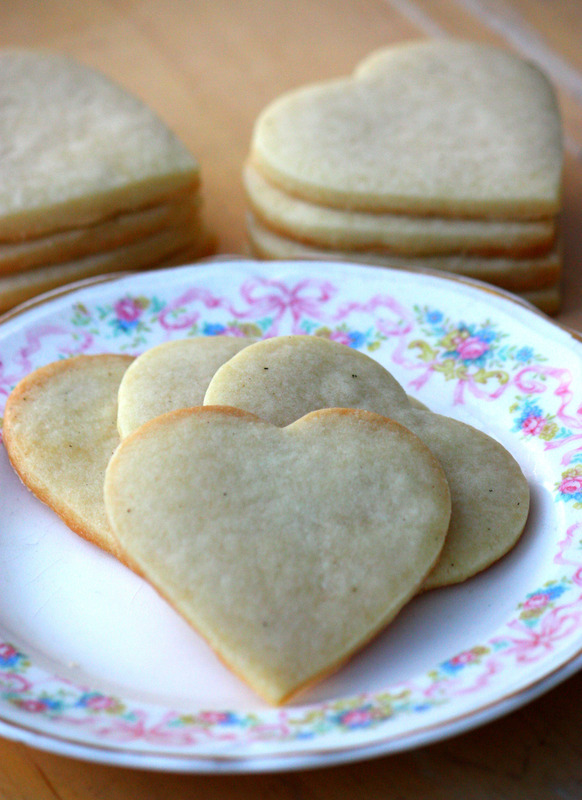 Cut out cookies with a 2 1/2- to 3-inch heart-shaped cookie cutter. Place on parchment-paper-lined baking sheet. Preheat oven to 325 degrees. While the oven's heating, set the cookies someplace cold — either the refrigerator — or outside, if you don't have room and the air temperature outside is cooler. Bake the cookies for 10 to 12 minutes or until just cooked through — they needn't be colored or browned. Cool on a rack. This basic royal icing from Cookie Swap by Julia Usher (Gibbs Smith, 2009) has been my standby for years. I've used both raw egg whites (saved in the freezer after making ice cream or other yolk-intensive projects) and meringue powder, which is widely available at craft stores and baking supply sites. I think the raw whites may taste a little better, but the meringue powder has the advantages of being pasteurized and easy to work with. Beat in flavoring and/or food coloring, if desired. Mix well and thin with water to desired consistency before using. Extensive instructions, with photos, can be found at Julia Usher's excellent website, Cookie Connection. There you can find guidance on beadwork, piping, stenciling and flooding, along with photo galleries of cookies much more beautiful than mine. My own instructions, given here, are just a sketch to get you started. You'll need 3 different colors of icing, thinned to the consistency of Elmer's Glue or slightly thicker. (That works out to about 2 to 3 tablespoons of water per cup of icing; add drop by drop as you get close. You can thicken the icing back up with confectioner's sugar.) Put one color in an open tub and the other two in parchment paper cones or piping bags with a small round pastry tip. Or, if you want maximum color combinations, divide your three colors so that you have a tub and a piping bag for each color. 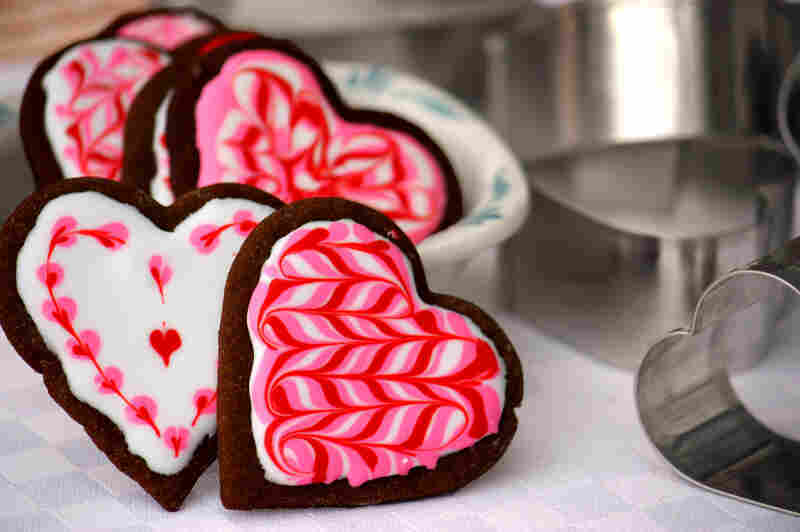 Coat the whole cookie with one color of icing, spreading carefully but quickly with the back of a craft paintbrush. Pipe lines or dots of contrasting color icing onto the wet topcoat. Drag a toothpick or darning needle straight across the lines, reversing direction when you reach the cookie's edge, to create a marbled effect. For miniature hearts, drag your needle through dots. Topcoat the cookie with icing in whatever color you like and let dry, preferably overnight. For the brush embroidery, you'll need a thicker, slightly pasty consistency of icing (thinned with about 1 to 2 tablespoons of water per cup of icing). Once you've got the consistency to your satisfaction, fill a parchment paper cone or piping bag fitted with a small round tip with the icing. Pipe curved petal outlines onto the cookie. Dampen a very small paintbrush (preferably square-tipped) and blot the excess water from the tip. Brush the icing toward the center of the petal to create a delicate shaded effect; finish by piping small dots at the center or in the background as desired.